The Wax Chemists at Choad Cheese Wax have created an effective and inexpensive waxing solution for those riders who don't do their own hot waxing, or have forgotten to wax before heading to the mountain. The Rub N Nut is a formulation of Microcrystalline, vegetable and hydrocarbon waxes with the addition of a surfactant that provides both glide and protection for your base in a range of snow conditions. To use: rub the wax vigorously into the bottom of your board or skis and buff with pad until glossy & smooth. The harder you rub the wax into your base, the longer it lasts. DO NOT use as a hot wax- the micro-crystalline composition is formulated for rub-on only. No irons, no melting. Choad Cheese Wax believes that riding snow is the funnest thing on Earth. And we believe that everything associated with riding should be fun too, so we built our brand on that simple principle. Choad Cheese Waxes have the tech to maximize glide in all snow conditions and has been rider tested and approved from Mt. Hood to Hokkaido. 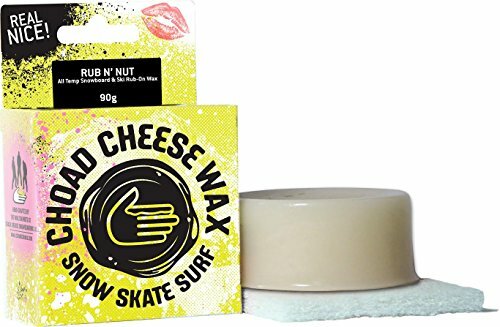 And to add fun to your waxing sessions, Choad Cheese Wax is available in a wide variety of scents to maximize your stokequillibrium for a glorious day of shred. Rub-on Wax with buffing pad included. 90 grams will last for several seasons- this is the most durable rub on wax out there. Works well on all snow conditions and in all air temperatures. Handcrafted High Quality Snowboard Rub-On Wax. If you have any questions about this product by Choad Cheese Snowboard & Ski Wax, contact us by completing and submitting the form below. If you are looking for a specif part number, please include it with your message. ZUMWax Ski/Snowboard RACING WAX - COLD Temperature - 100 gram - INCREDIBLY FAST in COLD TEMPERATURE !! !